He lives with his family in Sweden where he got the inspiration for his first book for children. He publishes in English and Polish. He is a person of many interests like photography, travel, popular science (he is a chemist by education) and languages. The Boy and the Big Fish: Vol. 1. How did the Boy catch the Big Fish? by Gregory Mynarczuk revolves around a boy who lived in a log cabin by the forest near a small river. He loved playing with his friends and sister, hearing fairy tales and reading books. Usually he went fishing with his father but one day he went alone to fish in the nearby stream. He hooked the worm and cast the fishing rod. He caught a couple of fish and was about to give up and go home when the float of the fishing rod moved. The boy could not hook the Big Fish out of the river. His fishing rod broke into half and the Big Fish swam away. The next day he took his dad's fishing rod and that broke too and he could not catch the Big Fish. The Big Fish was really strong and the boy could not hook it out with the help of his dad. They knew the fish was magical because it swam in a river smaller than itself. The news about the Big Fish spread all over the town and everyone wanted to see it. Will the little boy be able to catch the Big Fish? If so, how did he do it? The story is enchanting and magical and readers will be glued to the book till the very end to learn how the boy catches the fish. The illustrations by Malgorzata Osieleniec are colorful and lively and they breathe life into the boy, the Big Fish, and the entire story. Undertones of kindness and love run through the story in a subtle way, making it an endearing tale. There is a lot of action in the book while trying to catch the Big Fish and pull it out of the river, which gives a good pace and movement to the story. 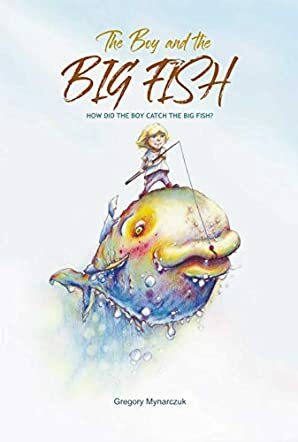 It is a lovely book for storytelling sessions in classrooms and, like me, readers will definitely be waiting for Volume 2 to see how the boy and the Big Fish meet.